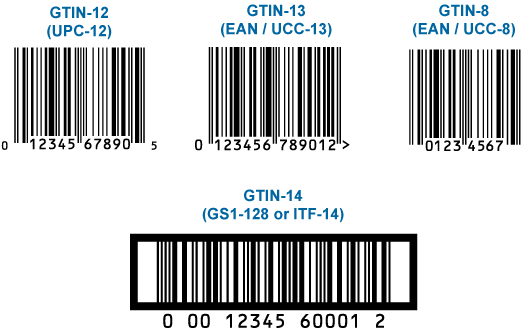 GTIN describes a family of GS1 global data structures that employ 14 digits and can be encoded into various types of data carriers. GTIN data structures are normally used within bar codes, but are also used in other data carriers such as radio frequency identification (RFID). The GTIN is only a term and does not impact any existing standards, nor does it place any additional requirements on scanning hardware. For North American companies, the UPC is an existing form of the GTIN. Today, five symbologies support this GTIN data structure: UPC; EAN; ITF-14; UCC/EAN Code 128; and GS1 Databar (formerly Reduced Space Symbology). Of these, ITF-14, GS1-128, and GS1 Databar employ 14-digit data structures of which the 14th character is a packaging level indicator (i.e., item or case). Both UPC and EAN have an implied packaging level of a single item. Therefore, these symbologies support the GTIN data structure without changing the number of encoded data characters. The table below further illustrates the relationship between GTIN, legacy terminology, symbologies and use at point of sale. In most cases, the legacy terminology and the symbology are called by the same name. GTIN changes this by separating the name of the data structure from the data carrier or, in this case, the symbology. Retailers who wish to accommodate GTIN need to make an important change to current practices because the full 14-digit data string must be processed and stored. Since the inception of bar codes with the UPC more than 40 years ago, hundreds of thousands of possible number combinations have been issued as manufacturer or company prefixes. GS1 has continually changed the standards of the issuing numbers, since GS1 standards are being integrated by other industries and more companies are requiring prefixes. The full 14-digit GTIN is achieved on a data carrier of shorter length by ‘padding’ the number with left-justified zeros out to 14 digits. See the examples below. Nothing has really changed in terms of the bar codes that will be used. The UPC is not going away; GTIN is term referring to how the data is stored, i.e., padding the item number with zeroes to a uniform length. 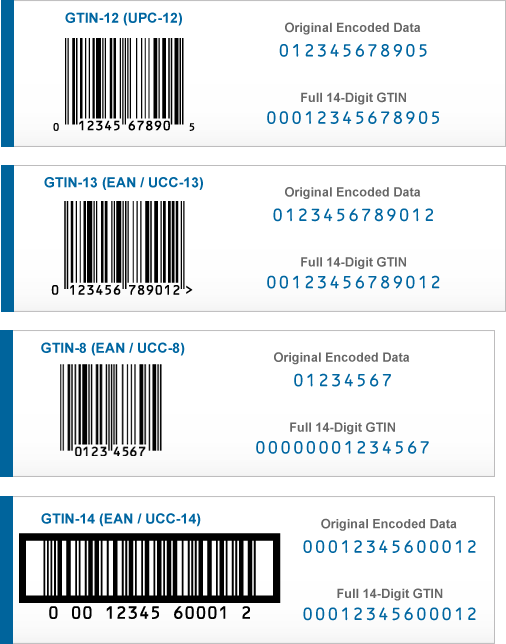 Most scanners in use will already scan any bar code within the GTIN family. The storage of the numbers is the issue being addressed. To view the GTIN Management Standard from GS1, click here. To learn about GS1 and additional barcode/numbering requirements, click here. www.gs1-us.info is tutorial website provided by Bar Code Graphics to educate for companies who require UPC barcodes.